Perfect Series Ending with Max and Cheyenne!! Max and Cheyenne ware the finale to an incredible series. It was kind of bittersweet to read this last book. I am so glad that Max finally gets his chance at what he thought he would never have. Cheyenne thinks that everyone will eventually leave her so she slowly tries to back away before her friends can, but Max doesn't let that happen. I loved this story so much! There were a lot of questions that still needed answers when i started reading and Carrie Ann did amazing by answering all of them. She ted this series up perfectly. Ups and down, love and passion, and perfect amount of tension and suspense to keep the pages flipping. I'm going to miss all the Brentwoods, but i'm so happy with where this ended! When I started reading I couldn't put it down.Carrie Ann Ryan magnifysent and amazing writer.I cannot wait to read more of there books.Keep up the great work.You should definitely read this book.Can't wait for the next book. The perfect conclusion to the Talon Pack series. 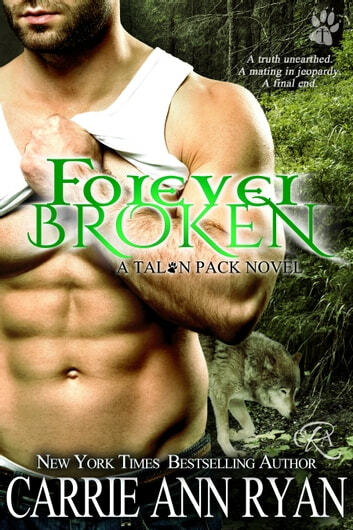 Carrie Ann Ryan’s FOREVER BROKEN is the perfect conclusion to the Talon Pack series. This is Max Brentwood’s and Cheyenne Liles’ story and the end of the Aspen war. I was looking forward to Max’s story. He was the smiling Brentwood until he lost his arm in a battle. He is a good guy that deserves to be happy. The book starts out with him saving Cheyenne’s life after Blade, the Aspen Alpha tries to kill her. He discovers that she is his mate. I like Cheyenne, she is a strong heroine. I love that she’s a vet. Her career worked well in the story. She was feeling left out as her friends started mating with the pack. As a human, her lifespan would be shorter than her friends, so she separated herself from the others. The plot was original and skillfully executed. So many interesting things occurred that made FOREVER BROKEN an amazing read. Everything perfectly came into place. Blade was a devious adversary. I appreciated that both Max and Cheyenne never really felt like they belonged or knew their role until they became mates and their destiny played out. The novel had a fantastic ending that made the series feel complete. I’m hoping for another spin-off series. I love all of Carrie Ann Ryan’s characters. I voluntarily reviewed an advance reader copy of this book. This was a bittersweet read. One I loved, because I love this series, this pack, this family. But one I knew was ending...at least for now (hopefully). This was Max & Cheyanne’s story, and it starts out with high stress levels. Not gonna lie, you’re pretty much going to feel like that throughout, but that’s to big expected when you know a big battle will be coming. But there’s also the good feels, the love and family and togetherness. If you haven’t read this series yet, you need to!! This will forever be a favorite series of mine, I can’t wait to jump in and start from the beginning again!!! Amazing conclusion to a fantastic series! Forever Broken is the finale to the Talon Pack series and it definitely ends with an explosive bang! I have liked every book in this series and each one continues to get better. With this one, the final battle with Blade is coming, but he has some more tricks up his sleeve and he is willing to destroy everything to get what he wants. Including innocent lives and bonds that go bone deep. Carrie Ann Ryan pulled out all of the stops with this book. She brought back older characters from the series and integrated them seamlessly in this book. Cheyenne’s character is such a powerful female character in this book. Her determination and resilience really surprised me and made me like her more. And Max … WOW. He is very pragmatic, but he is so much more than that. He really steps up to the plate in this book and I feel that made the story so much better! Overall, completely and utterly AWESOME! This was an epic conclusion. The characters are very likable and the story was easy to follow. The tension culminated into an ending, that while surprising, totally fit with the progression of this series. So, two very big thumbs up from me! Happy reading.